In this early reader with five short chapters, emerging readers meet Pig and Goose. Pig is happy. She loves to dance. She loves to eat. But she cannot fly. And she cannot swim. Goose can fly like a bird. Goose can glide across the water beautifully. But he cannot tell stories or host a party like Pig can. Pig and Goose are very different. But what they do have in common is that they like each other. And they love springtime. Simple text and charming illustrations guide beginning readers throughout the story and encourage independent reading. Rebecca Bond is a children's book author and illustrator. Some of her illustrated titles include The House That George Built and The Mysterious Woods of Whistle Root (Houghton Mifflin Harcourt). She is both the author and illustrator of Escape from Baxter's Barn (Houghton Mifflin Harourt), Out of the Woods: A True Story of an Unforgettable Event (Macmillan), and several others. Rebecca lives in Boston, Massachusetts. Pig decides to embrace the first day of spring with a picnic by the pond. As she skips in that direction, a white dot in the sky catches her attention. "The dot got bigger and bigger. The dot came to land right by Pig! The dot was not a dot at all. It was a goose!" Thus begins a special friendship reminiscent of many classic pairs in the beginning reader canon. In three short chapters spanning less then twenty-four hours, readers join these two as they get to know each other better. In the first chapter, Goose tries to teach Pig to fly, with comical results. In the second chapter, Pig comes to terms with the fact that she cannot swim, either, and will never be graceful like her new friend, Goose. "'But,' said Goose, 'you are other things.'" While the chosen vocabulary consciously supports newer readers, the text remains smooth and expressive. The comfortable line-and-watercolor illustrations capture both the season and the spirit of the story while providing some visual cues to help readers along. In the final chapter, Pig throws a party that evening at her house. She prepares delicious food, tells great stories, laughs and dances. "'Pig,' whispered Goose, 'you are wonderful.'" These two have already noted their mutual appreciation for all the seasons—perhaps they will experience them together in future adventures. This delightful transitional reader, dedicated to Arnold Lobel, celebrates the joy of new friendship. In the first chapter, Pig fixes herself a picnic on a beautiful day. The small white dot she spies turns out to be Goose, who lands right beside her. When Pig admires her new acquaintance’s flying skills, Goose offers to teach her. But try as Pig might—and she is quite determined—she cannot leave the ground. “Pig put her head back and laughed loudly. Goose held his belly and laughed, too. They rolled in the road and snorted and honked. They laughed until they cried.” In the second chapter, the new friends share Pig’s picnic by the pond. Afterward, they rest, and Pig dreams she is flying. When she awakens, Goose is gone. The porker again notices a dot—this time in the water—getting larger and larger. “ ‘Wow!’ exclaimed Pig. ‘You can swim, too!’ Goose blushed. ‘Gosh,’ he said, ‘it is nothing. All geese can swim.’ ” Pig asserts that swimming is elegant, graceful, and quiet but laments that she herself is none of these things. The modest bird assures his friend that she has other talents. 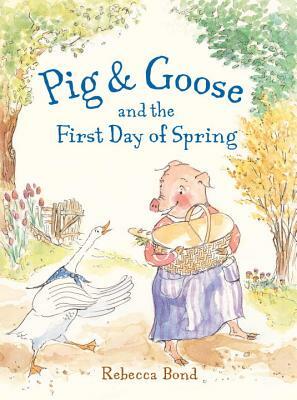 Brightening, Pig invites Goose to a “First-Day-of-Spring Party.” In the final chapter, Pig hosts her party, which features many friends, delicious food, stories, and dancing. “ ‘Pig,’ whispered Goose, ‘you are wonderful.’ ‘Really?’ Pig said, blushing. ‘Me?’ ‘Yes,’ said Goose, ‘you.’ ” Late that night, they tell each other how happy they are to be friends and make plans for another outing. The delicate watercolor and ink illustrations are as pleasing as the heartwarming text, which will appeal to children and their grown-ups. VERDICT A lovely story to share with preschoolers and young independent readers. An excellent selection. An unlikely friendship between a portly pig and a graceful goose blooms in a springtime story infused with compassion and gentle humor. When Pig observes Goose's grace in flight, she asks the fowl to teach her. Pig's attempts at flying are laugh-out-loud funny, but it's a shared laugh, not at either character's expense. Despite their considerable differences, the two charmingly anthropomorphic animals become friends. "Goody gumdrops!" sums up Pig's perennially positive attitude, so her disappointment when she cannot learn to fly like Goose is palpable. Her amazement at Goose's ability to swim is equally believable, causing her to rue that she is not "elegant," "graceful," or "quiet," like Goose. Goose graciously points out that Pig is "other things." Goose is gratifyingly appreciative of Pig's delicious cooking, her skills as a hostess and raconteur, and her infectious enthusiasm for picnics and parties. Bond breaks the fairly extensive text into three chapters, making the story feel approachable while giving new readers a sense of accomplishment. Simple, repetitive vocabulary and no more than eight lines of text per page help make the story accessible. With 48 pages and an on-the-large-side 7-by-9-inch trim size, the book leaves plenty of space for Bond's expressive watercolor illustrations on every page. Find Pig and Goose a place on the friendship shelf with the likes of Frog and Toad, Elephant and Piggie, and Houndsley and Catina. Limited vocabulary doesn't mean early readers can't be lyrical. Bond (Out of the Woods) demonstrates as much in a passage about spring: "They watched the wind play in the new leaves. Everything whispered and waved and danced." Three linked stories accompanied by fanciful pen-and-wash drawings explore the theme of identifying gifts. In the first, Pig tries to learn how to fly like her new friend Goose, but fails ("I have never seen a pig fly," Pig admits). Next, she admires Goose's ability to swim ("Swimming is so elegant. So graceful. So quiet. I am none of those things"). When Pig throws a marvelous party, though, it's Goose who's impressed: "'Pig,' whispered Goose, 'you are wonderful.'" Innocent exclamations abound ("Goody gumdrops! "), and so do sincere and generous sentiments. Pig is rosy cheeked and ample waisted, and wears rather dumpy clothing, while Goose is sleek and handsome. Yet it's Pig who keeps her guests enthralled and who pays attention to beauty. It's a quiet but effective reminder that an individual's appearance and skills are not the source of his or her worth. In the first chapter of this beginning reader, Pig sets off for a picnic on the first day of spring and meets Goose. "How well you fly!" she comments, and Goose suggests that he teach her; alas, pigs famously do not fly, but rather than feeling disappointed, Pig sees the humor in the situation and the two friends enjoy a lovely—grounded—picnic. Still, Pig is feeling a bit useless, but then she remembers she's a good event planner, and the first day of spring (and the book) ends with a dinner and dance party. Charming and goofy Pig and Goose are surely kin to Frog and Toad, and there's gentle humor and whimsy threading through the story. The repetition of words, short sentences, and the three-chapter set up make this an ideal choice for older listeners transitioning to young readers, but the playful dialogue also lends itself to reading aloud. Bond's watercolor art creates a quiet, dreamy world with softly dappled textures and a subdued palette against a creamy background until a full page spread of brighter blues and greens captures the night sky of the waning spring day. Fans of Pooh and Co. and The Wind in the Willows will want to make pals with Pig and Goose and hope for another seasonal outing.